They can also be quite annoying for the simple fact they always find a way of seeping into my head and camping out for days until they are practically part of my psyche. However, when done properly, they really do work. ("Call One Eight Hundred Two Six Seven Two Thousand and One ALARM FORCE! "; "Eight Hundred Five Eight Eight Two Three Hundred EMPIIIIRE!"). My apologies if you have zero idea what I'm on about, but consider yourself lucky. AND DO NOT, I REPEAT, DO NOT GOOGLE these jingles unless you want to sing them for the rest of your life. I was listening to the radio one morning, preparing breakfast and lunches for school when one came over the airwaves and stopped me in my tracks. It was a woman power ballading about where one should go if injured on the job - at least I'm pretty sure that's what she was going on about. Instead of my brain digesting the tune as it usually does, I immediately focused on the woman herself. "Wow. She's really into this. What's her story?" "Was she injured herself?" "Does she enjoy singing jingles?" "Did she beat out others to get this gig and if so, I wonder how many?" "Did she secretly aspire to be a pop singer, but couldn't make it?" Suddenly, I had questions. So many questions. Welcome to my brain, folks. Without warning, my mind turned a sharp corner and steered to the attention of those that sing theme songs. From there, it went onto children's theme songs. When I finally snapped back to reality, I have no idea how I packed my kids lunch boxes or if I even did a proper job. For all I know, I tossed in a tin of tuna and a can opener and hoped for the best. Theme songs in general are quite catchy, but children's cartoon theme songs can be pretty memorable as well. I remember back in my day of pigtails and Kool-Aid moustaches, Saturday morning cartoons were everything. I absolutely loved the theme song to Gummi Bears. In fact, I loved it so much, I rigged up my trusty tape recorder to record it off the television, praying no one would talk over it so I could have a perfect copy to play over and over. Back then, I obviously appreciated a man that could belt out a song about those chewy little bastards and own it. It was so inspiring. I guess I want to know at what point does one know they were meant to sing jingles and not open for, I don't know, Taylor Swift? Singing jingles is a respectable profession, don't get me wrong. It's a talent I certainly don't have and I'm not knocking anyone who does, but there are questions. For starters, how does one bring it up into a conversation? Him: "Hey. Can I buy you a drink?" Her: "Uh, sure, thank you." Her: "So what do you do for a living?" Her: "Really? Have I heard any of your work?" Him: "Yeah. I sing the theme song to PAW Patrol?" As off the wall as my thoughts are/can be, this is where my creativity comes from, friends. Caramel Pecan Sticky Buns aren't exactly the newest creation on the planet, but they are a take on my Mom's incredible Pecan Sticky Buns, which have been known to make a grown man cry. She's got the magic touch I haven't quite mastered, but I'm trying. Until then, I'm offering up my own version of these lovelies. Trust me, they're still delicious. I wonder if I could get someone to sing a jingle about these? A power ballad would work quite nicely. In a separate mixing bowl, combine dry yeast, warm water, and 2 tablespoons sugar. Stir slightly and allow to set for about 5 minutes. If your yeast doesn't 'bubble', it's no longer active. You'll need to get fresh yeast. Place dough into prepared greased bowl and cover with a tea towel. Place the bowl in the oven with the light on. The light from the bulb provides the oven with just the right amount of warmth for it to rise. Allow it to set for about an hour or until dough doubles in size. In the meantime, make caramel sauce. In a large saucepan over medium heat, melt butter, brown sugar, and golden syrup just until all ingredients are warmed through and blended. 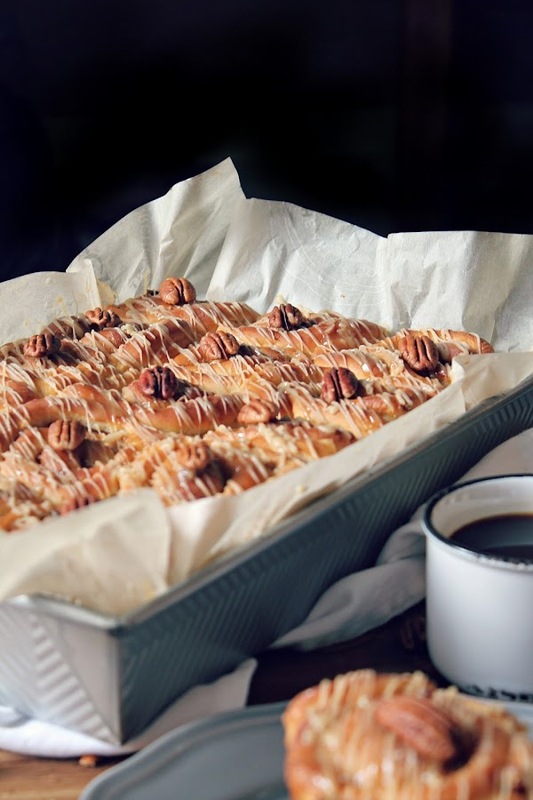 Pour sauce into a prepared 9x13 baking dish and sprinkle with pecans. Set aside. Turn dough out onto a lightly floured surface. Using a rolling pin, roll out dough into a rectangle. Brush dough with melted butter and sprinkle with brown sugar mixture and pecans. Carefully and tightly, roll up edges from the longest point, one end to the other. Cut into 2, 3, or 4 inch pieces, depending on how big you want your rolls to be. Place rolls into dish prepared with caramel pecan sauce. Cover with a tea towel and allow to rest for 30 minutes. They will get bigger in size. Once rolls have doubled in size, preheat oven to 350ºF. Bake for 25-35 minutes or until tops are golden brown. 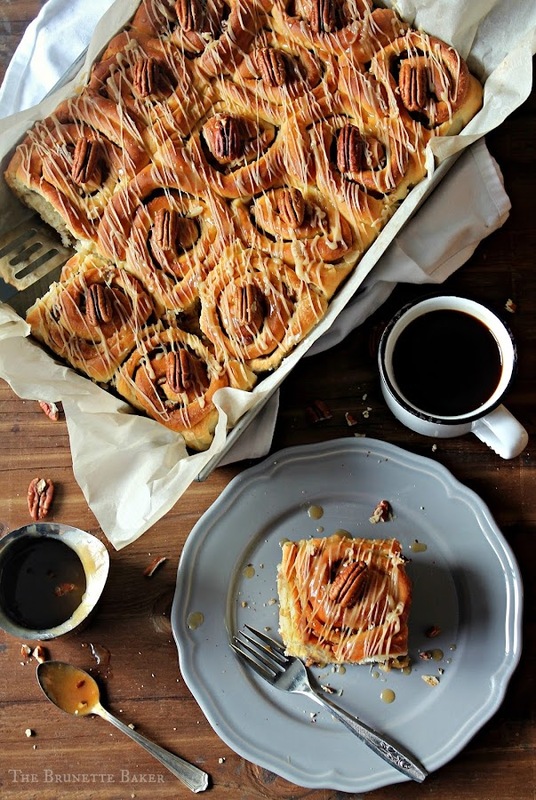 You can completely omit the drizzle and invert pan so caramel pecan sauce oozes down the rolls or you can leave them as is and add drizzle for a little something else. I love them both ways. Combine all ingredients in a bowl. Drizzle over top warm rolls - it will firm up. For a super sweet treat, you can prepare caramel rum sauce listed about and drizzle over rolls as well. Wow these sound too good! And they look perfectly baked too. Oh my goodness -espresso drizzle is genius!! I can just imagine how perfect these would be for breakfast, all warm and sticky accompanied by coffee. YUM! 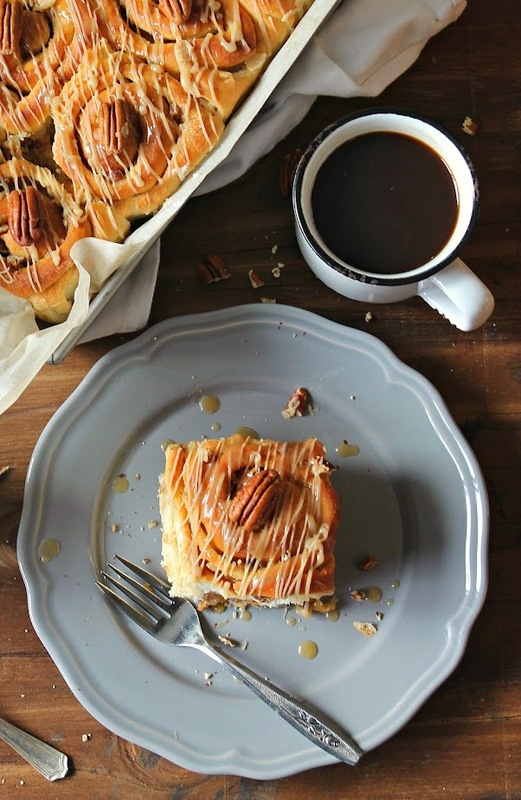 and these sticky buns------CARAMEL AND PECANS AND CARBS AND AH EVERYTHING DELICIOUS! This post is hilarious! Jingles are weird. I once sang one for three days. No matter how hard I tried, I couldn't get it out of my head. I love these rolls! I cannot wait to make them! These would be perfect with my PSL! Pinning. These sound so delicious! <3 I'll take a dozen!